He's got a chauffeur who's a genuine dinosaur. "Many people (including some scientists!) are confused about what is or isn't a 'dinosaur'. They think that flying pterodactyls or fin-backed Dimetrodon or seagoing plesiosaurs or woolly mammoths are dinosaurs. THEY ARE WRONG!" Dinosaurs are pretty cool, which is why they are frequently seen in fiction. However, creators do not always prioritize historical or scientific accuracy when dealing with these prehistoric creatures in works. As such, dinosaurs often appear in the wrong time period, along with humans (unless appropriate ), possess special abilities that they otherwise would never have had, or are treated as pets or friendly characters. In Real Life many of the most commonly-recognized dinosaurs lived in different habitats, continents or time periods. Some prehistoric creatures, like pterosaurs and plesiosaurs, are technically not even considered dinosaurs. Fortunately, some educational programs attempt to avoid these pitfalls. Subtrope of Artistic License  Biology. See also Everything's Better with Dinosaurs, Dinosaurs Are Dragons, Slurpasaur, Dumb Dinos, Raptor Attack, Ptero Soarer, Living Dinosaurs and 1 Million B.C.. For mistakes pertaining to dinosaurs today, see Artistic License  Ornithology. Compare Dinosaurs, Stock Dinosaurs (True Dinosaurs), Stock Dinosaurs (Non-Dinosaurs), and Prehistoric Life. For common inaccuracies of prehistoric creatures in the media, please check out the Analysis page. Lampshaded in Magical Shopping Arcade Abenobashi, when the characters land in "Scientifically Inaccurate Prehistoric Abenobashi". Gantz is a partial aversion. Its raptors (actually aliens masquerading as raptor models in a museum) are notably covered in feathers (or maybe fur, but we'll be optimistic). On the other hand, the T. rex shoots fireballs... well, they're aliens. Genesis Climber MOSPEADA subverts this trope: Stick and Ray fall into an underground cavern, where they see a mishmash of various kinds of creatures from different periods, including Dimetrodons, apatosauri, and tyrannosaurs. At first, Ray mentions that something "seems odd" about it, but he can't put his finger on it. Later, he realizes that the dinosaurs are a spattering of dinos from different periods, and the 'cavern' is actually a laboratory where the Inbit are trying to determine the form of life best suited to their "new" planet. Dragon Ball features characters who either have the ability to fly or have a flying device with them. Convenient enough, there are some pteranodons or other prehistoric fliers around. Is someone still unable to fly? No problem, just bring in the T. rex. To be fair, Dragon Ball has a whole lot of other weird stuff so that the pterosaurs and such fit right in. Given that there are also canon dragons wandering around, it's likely it's just a Rule of Cool alternate Earth. Not featured in the manga, in the anime though? In Dragon Ball Z, there are the same dinosaurs...on Namek. Which could be intended to imply that Kami brought them with him to Earth. Though given the relatively small size of his spaceship, he could only have brought eggs. Another error is Toriyama's design of the Tyrannosaurus—first off, it has what look like horns on its head—now there MIGHT be tiny brow ridges over its eyes, but the design he used is completely off. Secondly, Tyrannosaurus had tiny arms with two fingers—he seemed to have based the arms on Allosaurus. And fourth, it is much too big. Tyrannosaurus would be 12-13 meters long (42-45 feet) and 4 meters high (13 feet), yet are drawn nearly 20-30 meters long and 10 meters tall. One Piece has at least one island with dinosaurs, not that this is out of place given the rest of the world. It's surprisingly more biologically accurate than Dragon Ball Z's dinosaurs. Averted in the Gaiden chapters of Saiyuki; what looks like a rampaging T. rex is proved to be genetically engineered to do just that by the Big Bad. Pickle in Baki the Grappler. Holy heavens. Again, Itagaki Keisuke takes his "almost realistic extreme martial arts manga" and reminds us that it's a "freaking Rule of Cool extreme martial übermensch manga", with Pickle, the Jurassic man. Revived after being found frozen kicking a T. rex in the mouth. You Are Umasou has tyrannosauroids that shift from tripod stance to horizontal stance, the now dubious genus "Titanosaurus", a really bendy-necked elasmosaurid, and a mosasaur with a dorsal fringe, as well as a bit of Anachronism Stew and Misplaced Wildlife. On the other hand, it has feathered maniraptors, hadrosaur nesting colonies, migrating herbivores, pack-hunting tyrannosauroids (a questionable speculation), and snow-roaming dinosaurs. The purple Chilantaisaurus (according to the book and second episode of the animated series) trying to eat Umasou in this scene has a rather interesting case in which it may be hand waved. It is depicted with bull-shaped horns, and yet at the same time no decent skull material of the animal was found yet (although its skull may be no different than other carnosaurs and could have stubby horns). Although because of the horns, some viewers refer to it as a Carnotaurus. Never mind that it has huge arms and claws, which Carnotaurus lacked (and Chilantaisaurus did have). The first Doraemon movie (and its remake) refers to a plesiosaur as "Nobita's dinosaur". Not that the franchise doesn't have other examples (Science Marches On aside). In Cage of Eden, creatures from different points in history, who all lived in very different habitats, live in the island where the characters are marooned at. Justified since it is later revealed that the monsters are but man-made clones. Played straight: During the Runaways/Young Avengers crossover, the young supers find themselves hit by a mini-blizzard. While the humans quickly shrug it off, Old Lace is rendered practically catatonic, and almost dies, because she's "cold-blooded". However, it was John Ostrom's study of Deinonychus which largely brought on the "Dinosaur Renaissance", which drastically altered the scientific and popular conception of dinosaurs. This renaissance has ultimately resulted in, at the very least, a consensus that some dinosaurs (such as Deinonychus) were closer to modern, warm-blooded birds than to modern, cold-blooded reptiles, physiologically speaking. It's also worth mentioning that Old Lace wasn't "born" in any sense, but was genetically engineered in the 83rd century. Anything odd about her appearance or physiology pales in comparison to her having a telepathic link with Gert. Subverted in a Batman comic. During the Knightfall storyline, Batman and Commissioner Gordon find a dead man inside the skeleton of a dinosaur. Gordon calls the dinosaur a "Brontosaurus" before being corrected as Apatosaurus by a curator, who tells them the story of how the skull of one dinosaur matched the head of another and the other way roundnote Although this is actually a common misconception. It's true that Brontosaurus was a spuriously assigned new genus for what only qualified as a new Apatosaurus species, and that it had the wrong head, but these are two separate issues with the fossil that have become conflated in the public consciousness, giving its "two-head" clue about the culprit: Two-Face. Although in a case of Science Marches On, more recent classifications say that Brontosaurus and Apatosaurus are different genera after all. Even before this reclassification, the comic was wrong about its clue. Brontosaurus was never one dinosaur with another's head, it was simply two different specimens being described and assigned names by different scientists; when it was decided they were actually the same species the slightly older name took precedence as is standard practice. In fact, no head was known for either dinosaur - the first Apatosaurus skull was found 4 years after the famous American Natural History Museum exhibit had been built, and was not confirmed and generally accepted for another 70 years (the first skull was not attached to a skeleton, so many questioned which dinosaur it actually belonged to). The "wrong" head for Brontosaurus was simply a best guess at reconstructing it, and was thought to be a pretty good fit for either one. Though the prehistoric beasts in this Batman comic seem to be robots of some sort, allowing for some errors, there is one completely unforgivable mistake: they misspell the word "dinosaur"! Cadillacs and Dinosaurs... look at the title. If you're expecting accuracy from a series involving dinosaurs coming back several hundred years in the future, why are you even bothering? According to one Chick Tract, the dinosaurs escaped the great flood by getting on the Ark with all the other animals. Unfortunately, the flood destroyed much of the plant life, and the reduced oxygen levels made them sluggish and slow. They were ultimately hunted into extinction by human hunters who considered "dragon meat" to be a delicacy. Bringing dinosaurs back to life from their skeletons in museums, despite the fact that dinosaur skeletons in most museums are A) held together with wire, and B) are fibreglass replicas of fossils, which are bone-shaped rocks, or C) even if they're the authentic article, are bone-shaped rocks. Rock contains remarkably little genetic material (i.e., none). Attempting to free the world for dinosaurs by having hundreds of humans in New York conveniently start acting more animalistic and killing each other... using a magic piece of meteorite that he found in a jungle. A particularly glaring error in that story arc (as if the main plot weren't glaring enough) was where a modern lizard is regressed by exposure to the meteor and turns into a Velociraptor. Lizards are not descended from dinosaurs, nor are they closely related to them. If it had been a mutated pigeon, it would have been reasonably accurate, relatively speaking, but for a lizard it's on the same scale as showing a human somehow "regressing" into a water buffalo or a dolphin. Given that Stegron himself is weakened by the cold and speaks in Sssssnake Talk, the writers clearly assumed dinosaurs were typical reptiles. 150,000 years ago, the title character of Rahan (a very well known caveman in France) encounters dinosaurs and sees them as survivors of a very distant past. It's really not as outlandish as some of the other examples on this page. The entire storyline of Dinowars revolves around dinosaurs escaping into space to avoid the ice age, growing into a highly evolved civilization, and then returning to Earth to reclaim what is rightfully theirs. Dr. Dinosaur in Atomic Robo claims that "mammal energies" traveled back in time and granted him super-intelligence while wiping out all the rest of the dinosaurs, and then he built a time machine out of rocks, fronds, and crystals to travel to the present and get revenge. His inaccuracies (such as lack of feathers and presence of a larynx) are largely justified however, when Robo points them out and dismisses Dr. D's story as absurd, assuming he's just a genetic experiment based on a Jurassic Park dinosaur rather than a real one. In general, it's a Running Gag that Dr. Dinosaur works his science entirely by Achievements in Ignorance, which means his appearance is more or less in keeping with it. In one of Hamilton Comics' Mighty Morphin' Power Rangers early issues, Bulk and Skull are seen being Power Rangers, with Skull as Ranger with a Brontosaurus theme. However, Billy points out that it's incorrect and that it would be more scientifically correct "Apatosaurus". Skull, however, thinks it's a hilarious pun and ends up knocking Bulk over in the process. Marville #4, oh boy . For starters, it is set on the "Jurassic Park", not "Period". In Tyrannosaurus Rex , while there's dinosaurs and humans living together, the raptors are coated in feathers. Horácio from Monica's Gang. A vegetarian baby T-Rex. Also, on Monica's Gang we have the Cavern Clan. Just imagine the Flinstones without all the American Sitcom situations to turn into something normal for prehistoric cavemen... like hunting dinosaurs. Jack Kirby did a very brief series called Devil Dinosaur that was clearly about having fun more than being accurate. There's a friendly "devil beast" (theropod of some sort; it's probably for the best it isn't identified) fighting against ferocious ceratopsians and a carnivorous Iguanodon (what. ), while coexisting with cavemen. There is a Soviet cartoon called Mother For Little Mammoth. It is about the eponymous mammoth who thawed out in our age searching for his mom. He finds one, an elephant in Africa. A truly happy ending, except one of the traits by which she accepts him is the fact that, like her, he has big ears — and the mammoth is pictured with such. Now, an elephant's big ears are heat sinks — mammoths didn't need nor have them. Big ears on mammoths might not be out of the question, particularly if it's a species that lived in warmer climates. The problem is that the mammoth in question is a woolly mammoth, which definitely did not have big ears. The World of the Creatures plays with the trope throughout. The story takes place in the mind of someone obsessed with paleontology. As such, dinosaurs show up frequently. In many cases both accurate dinosaurs - such as a fully-feathered Utahraptor - and inaccurate ones like the featherless raptors of Jurassic Park appear side by side. The "Rite of Spring" sequence in Fantasia may be one of the Trope Makers here. It shows off a random cross-section of prehistoric life in the space of a few minutes. In part, it's Science Marches On: it is proudly announced that this section is Based on a True Story. 25 years later, the Disney Imagineers created a Primeval World diorama for the 1964-1965 New York World's Fair, with many of the individual scenes apparently inspired by Fantasia. This diorama, which is currently installed at Disneyland in California, is a slight improvement on the film — the first scene shows dimetrodons in a Coal Age forest of giant horsetails (and giant dragonflies), and then moves to a Jurassic swamp with some generic sauropods, followed by scenes featuring Pteranodon, Triceratops, and Struthiomimus (all Late Cretaceous, although the precise ages differ somewhat). So far, so good; the sauropods look ridiculous and should not be munching water weeds in a swamp, but that can be put down to a combination of 1960's paleontological ignorance and artistic license. But then the final scene depicts a Stegosaurus battling some large carnosaur beside a violent lava flow. If the carnosaur is supposed to be a T. rex, as the narrator usually states, why does it have three fingers per hand, and what is the stego doing in the Cretaceous? You could ignore the narrator and assume that the setting has reverted back to the Jurassic for some reason, and the stego is fighting an Allosaurus... but that doesn't explain why stego has five tail spikes on its thagomizer . Sigh. Walt Disney has stated that the carnivorous dinosaur fighting the Stegosaurus is indeed a Tyrannosaurus. Paleontologists told him that T. rex should only have two fingers, but he declined because he thought people wouldn't recognize a Tyrannosaurus with only two fingers. Extremely evident in Disney's Dinosaur, which had dinosaurs from the Jurassic and the Triassic period interacting with Cretaceous-period dinosaurs. In an effort to show that the writers had done some research, they included a Carnotaurus as the main predator — too bad Carnotaurus lived in South America, while all the other dinosaurs were North American species, and furthermore were several times bigger than in reality. There was a Hand Wave when one character was astounded that the carnotaurs had come "this far North" (which doesn't work, since North and South America was separated by a sea at the time), and the Brachiosaur character was explicitly stated to be the only one of her species left. The main character had also been adopted by lemurs, when most mammals were superficially rat-like then. Also, iguanadons originally had their beaks, but Michael Eisner insisted that the dinos be able to talk, so the beaks were replaced by speech-friendly lips. The Land Before Time. Pity the professors of geology and paleontology who have small children at home, because all the errors in these films will indeed make a paleontologist weep. The original movie can be considered relatively accurate for its time (Anachronism Stew aside, and then only for stegosaurs and pelycosaurs), at least as far as dinosaur depictions in popular media are concerned. But the sequels and TV series zig-zag this trope several times, with notable aversions including the anatomically correct (if improbably large) Liopleurodon from "Journey to Big Water" and Ruby the Oviraptor having feathers. Rex from Toy Story is a green plastic Tyrannosaurus rex with three fingers on each hand instead of two like in real life. Justified, since he's a toy T. rex, which is often portrayed incorrectly, and a cheap knock-off from a small company that went out of business and was bought by Mattel in a Thanksgiving auction, at that. We're Back! A Dinosaur's Story features Anatosaurus, which is indeed a bona fide member of the duckbill group. Sadly, the duckbill is shown with a long bony crest on the back of its head more reminiscent of a Saurolophus or Parasaurolophus than a smooth-headed "Anatosaurus"... The Pteranodon is even worse, having a long tail and being bipedal. And she is mistaken for a bat, which is understandable given how ridiculously bat-like her wings are. Dino Time 3 D is not meant to be a biologically accurate film, but they did have one redeeming trait: a feathered baby Tyrannosaurus. The Good Dinosaur features dinosaurs together (such as Apatosaurus and Tyrannosaurus) that lived in different eras. The official explanation is that the movie is an Alternate Timeline of a almost-modern day where dinosaurs did not become extinct after a meteor strike 65 million years ago, but some of the dinosaurs depicted had gone extinct a hundred million years before that event. Not to mention the several anatomical inaccuracies (Apatosaurus being confused for Brachiosaurus, Styracosaurus having the horn arrangement of a Triceratops, raptors not having enough feathers, pterosaurs walking on their knuckles and one of them resembles a Nyctosaurus with teeth and wingclaws, etc.). The animators of The Missing Link (AKA B.C. Rock) evidently chose to completely forgo realism in favor of Rule of Funny. Aside from having humans, dinosaurs and prehistoric mammals coexisting, many of the animals are completely made up. Examples include a single-legged being with a trunk, an underwater elephant that lives in a giant shell and at least two humanoid (but non-human) species: the bottom-heavy "No-Lobes" and a tribe of feral Catgirls. It may come as a surprise that Communism, being scientific and that, would provide an example of the trope. Yet, the short GDR DEFA animation "Steinzeitlegende" ("Stone Age Legend") has a cart-pulling dino. According to the song "Walking in Your Footsteps" by The Police, the mighty Brontosaurus walked the Earth 50 million years ago. In reality, the most recent Brontosaurus remains are nearly 150 million years old, and the extinction of the dinosaurs occurred 66 million years ago. Iron Maiden's "Quest for Fire" mostly retells the story of the eponymous movie... except for the (hilariously overblown) opening line "In a time when dinosaurs walked the earth..." It should be noted that this was probably the band being funny, as they are history buffs and would know about things like this. Danny Saucedo 's song "Dinosaur Bones" from the album Drawings of Dinosaurs includes a line about pterodactyls flying in "the Pleistocene sky." By the time of the Pleistocene epoch, pterosaurs had been extinct for nearly 64 million years. The music video for Fat Boy Slim's Right here, right now obviously has no pretense to be an accurate portrayal of human evolution. For one, it begins 350 billion years ago, but it shows nothing but multicellular animals, which didn't evolve until about 600 million years ago. An early series of FoxTrot comic strips had Jason filming a dinosaur movie, with his pet iguana Quincy as the dinosaur. He called the film "Iguanadon Terror", even though Quincy looked nothing like an actual Iguanodon (Jason was aiming for something like a Dimetrodon, though when asking if Quincy could pass for a dinosaur he was told that Quincy only looked like an iguana with a fan taped to its back). A later strip had Jason doing a claymation movie called "Mesozoic Park"; he pointed out that Jurassic Park was mostly about dinosaurs from the Cretaceous period. In another strip, he was seen writing a letter explaining the brontosaur/apatosaur controversy to a cookie manufacturer that used the former term in the "Fun Facts" of their dinosaur cookie boxes. He then immediately tries to blackmail them into sending him free cookies. Another strip perpetrated the giant Liopleurodon meme started by Walking with Dinosaurs. Played for Laughs in one Sunday strip, where Jason claims Pachycephalosaurus might have hypnotized its predators because its head was so similar to Talosians (despite the fact Talosians have a very large brain whereas pachycephalosaurs are famous for having thick skull roofs which is where they got their name from) and that dinosaurs went extinct because of time-travelling big-game hunters. Bill Watterson, the author of Calvin and Hobbes, admits that his earliest strips involving dinosaurs were pretty embarrassing. After doing some research, and getting as excited about dinosaurs as Calvin, his drawings of dinosaurs became more and more accurate and realistic (as an aside, tellingly, most fantasy sequences in Calvin and Hobbes are drawn in a more realistic way than Calvin's day-to-day life). If you have a collection of Calvin and Hobbes anthologies, note that by around 1994, it's obvious that Watterson invested in a Gregory S. Paul book for anatomy and in a set of "Jurassic Park" action figures for posing and staging. One strip involved such realistic dromaeosaurids that they would scare small children. It didn't help that Calvin was talking about them eating small children. The little freak! Shortly after that strip, Jurassic Park came out, and Watterson stopped putting dinosaurs in the strip for a time so that they wouldn't be negatively compared to the CGI. Calvin: "This is so cool!" Hobbes: "This is so stupid." Calvin: Of course not, Mom! The Stegosaurus lived millions of years before the T. rex! Jeez, try not to embarrass me when we go inside, okay? An in-universe case of artistic license occurs when Calvin has an Imagine Spot of himself discovering the fossil of a new theropod, the Calvinosaur. It's as big in comparison to a T. rex as a T. rex is to a human being. The sort of monster any kid would love to give his name to. B.C., perhaps one of the most egregious examples of a newspaper comic that has both dinosaurs and humans. Incidentally, though the creator, Johnny Hart, was a self-proclaimed Christian fundamentalist, the scientific shortcomings seem to be less because of his beliefs and more for Anachronism Stew Played for Laughsnote The strip was started about two decades before he even had his conversion anyway..
After Hart's death in 2007, the strip started to feature dromaeosaurids, which are as usual featherless and no different than the ones in Jurassic Park. One strip did, however, point out how birdlike it was in an amusing way . 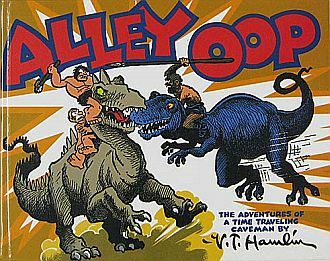 Alley Oop, starting in 1932, with his pet, Dinny. Before Television! The Far Side had many strips that showed or implied dinosaurs and cavemen living at the same time. However, the strip describing the "thagomizer" has been endorsed by actual paleontologists for giving a name to a certain part of stegosaur anatomy, even though it implied that said part posed a danger to primitive hominids. Gary Larson has said that he is well aware of the anachronism and while part of him justifies the cartoons on the Rule of Funny, part of him feels very guilty about using this trope, especially given the high regard in which he is generally held by the scientific community. One Beetle Bailey strip implies that life has existed on land for only five million years. Dilbert features Bob the Dinosaur, who interacts with modern humans rather than cavemen. At least one strip has implied that he woke up after hibernating for millions of years. Pearls Before Swine lampshades this in a strip where Pig writes in his report on paleontology that "Dinosaurs and humans lived together many, many years ago". Goat calls him out on it explaining dinosaurs and humans were separated by millions of years, which led to this exchange. Pig: What do I do with this chapter on The Flintstones? Invoked to the hilt in Gottlieb's Caveman, where the player maneuvers the caveman to hunt brontosaurs and pterodactyls while avoiding the Tyrannosaurus rex. Unsurprisingly, The Flintstones doesn't take "artistic license" with paleontology as much as it recklessly abandons it. Karl Pilkington from The Ricky Gervais Show often makes mistakes when it comes to pre-historic life (as he does with everything else), referring to how they lived with dinosaurs and other "facts" he picked up from fictional works. Ricky repeatedly tells him he's wrong and that he's either picked this up from The Flintstones or 10,000 BC and mistaking it as fact. Prior editions of Dungeons & Dragons handle the various species of dinosaur better than it does mythology, even pointing out the differences between the Velociraptor and the Deinonychus. They still list Pteranodon and Elasmosaurus under the same catchall of "dinosaurs", though; in the Fourth Edition, however, they are renamed Behemoths. Plus still allowing the Quetzalcoatlus and Elasmosaurus to swallow humans whole (note: not only could they probably never do that without dislodging their entire lower beak, but a Quetzalcoatlus with a human in its gut would probably be too heavy to fly). They honestly go in a lot of different directions with this, depending on the edition. At one time, dinosaurs were classified as Beasts (a different creature type from Animals, in much the same way that humans are Humanoids and most invertebrates are Vermin). Genius: The Transgression features a Bardo based on discredited theories of the Hollow World, which seems to be filled with every paleontological mistake ever made, such as brontosaurs (no, not apatosaurs, brontosaurs), the old Victorian notion of what an iguanodon looked like, and Piltdown Men. There is this very obscure, very low-quality board game sold in Hungary that goes by the name Küzdelem a dinoszauruszok földjén (Battle in the Realm of the Dinosaurs). Has only a handful of pictures, all of which contain horrible depictions of Stock Dinosaurs — one Brachiosaurus with a backwards knee, and one with shorter forelegs than back legs, standing as erect as a human; toothed, bat-winged Pteranodons with the bat fingers sprouting from the back of the wings; and gigantic, scaly Velociraptors with Therizinosaurus-like claws. In short, it is the board game equivalent of "Chinasaurs" (see lower). Yu-Gi-Oh! Trading Card Game has a "Dinosaur" type as one of its monster types: the type is mostly made up of the popular dinosaurs listed above, and unfortunately includes a mammoth. An undead mammoth. Fortunately, later, non-zombie Mammoth monsters (such as Big-Tusked Mammoth) are more correctly listed as Beast-Type. They also thankfully averted the "nekkid Raptor" trope with Black Veloci. A lot of the earlier dinos, though, were the classic "nekkid" version (but see also Dinosaurs Are Dragons). The older cards were victims of Science Marches On as noted above; those cards were first released before the feathers thing had been discovered. While we're on the subject of dinosaurs being given powers and placed on trading cards, Dinosaur King. In Dinosaurs Attack!, herbivorous dinosaurs like Parasaurolophus and Stegosaurus eat people frequently and messily, plesiosaurs have bendy necks instead of the stiff ones they had in real life, and trilobites are described as "flesh-eating worms" (real trilobites were not worms and even the predatory ones could not harm something as large as a human). This is in part intentional parody, though, since the 50's movies the cards spoof made similar mistakes. The following a note under "Brontosaurs" in the Sample Stuff under Dinosaur in Cartoon Action Hour: Season 3. Note: Currently, the correct term for this dinosaur used by real paleontologists is apatosaurus, and brontosaurus is scientifically outdated due to a fossil being falsely identified. However, the name brontosaurus is the word more commonly known and recognized in popular culture, no matter what the actual scientific classification might be. It was certainly the name that would-have been in common use in a cartoon in the 1980s. There's another "Raptor" who looks like he's just walked off the set of Jurassic Park in the Webcomic The Adventures of Dr. McNinja. However, given that the story that introduces Yoshi also includes Raptor-riding banditos, a conspiracy involving Ronald McDonald and MySpace, and a man whose incredible abdominal muscles have somehow transformed into a built-in jetpack (and the eponymous character, the only physician in a long line of legendary Irish Ninjas whose office is in the middle of a haunted forest and whose secretary is a gorilla), once again, the MST3K Mantra is in full effect. The "birdasaurus" in a later plot line, lampshaded with the mouseover "I hope my completely made up out of my mind with no reference whatsoever way of drawing the birdosaurus doesn't upset any of you junior paleontologists." Apparently the author still gets regular emails complaining about this, as he defensively mentions in a Note From Ed in this comic . Taken to absurd extremes with the horrorsaurus, a wingless, flying, tentacled monstrosity with four eyes. That one may have been artificially created by the other dinosaurs though. T-Rex: Guess what I got last night? A dog! Did you know that dogs and dinosaurs co-existed? Dromiceiomimus: Yes, I accepted it without questioning! It's actually possible to avert this by typing "&butiwouldratherbereading=somethingmorehistoricallyaccurate" after the comic of your choice. (Or at least avert to a greater degree. Pennaceous feathers on T. rex is unlikely, but at least they have feathers.) Here's an example. xkcd has Jurassic Park-style Velociraptors, which the author found traumatizing upon seeing said film. Averted in Feathers and Birds and Dinosaurs . 8-Bit Theater does a brilliant Lampshade Hanging in this strip. Also counts as a Moment of Awesome (and Funny). Played for laughs in The Order of the Stick when Roy is confused by the appearance of a Brontasaurus, when he knows it's a mixup of parts from different animals. His host points out he didn't have a problem with the hippogriffs. The Tyrannosaur Chronicles: Mostly averted. Lampshaded by Layla Oviraptor, who mentions that Desdemona Deinonychus and Larry the Tyrannosaur shaved off their feathers so they could star in Jurassic Park. This article makes tons of mistakes with animal relationships (claiming that Gastornis is close to kiwis and ostriches when it's really closer to ducks, and Hyaenodon close to raccoons when it's equally close to all carnivorans), confuses the "classic" saber-toothed felids with the saber-toothed sparassodont ("marsupial", in the article's words) Thylacosmilus , serves up an unhealthy serving of Anachronism Stew (Gastornis and Andrewsarchus actually died out long before the Pleistocene), makes unwarranted assumptions about ancestor-descendant relationships, and implies that dinosaurs are cold blooded. Their video about the cassowary not only suggests that pterosaurs are dinosaurs...but it goes on to suggest that pterosaurs evolved into birds. About the only similarity between pterosaurs and birds is the fact that both groups can fly. This one is better, though it implies tyrannosauroids to be carnosaurs (universally rejected since The '90s). The article "5 Weird Directions Human Evolution Could Have Taken" treats the existence of "the Boskop Man" as a fact, which in reality it most likely isn't . In addition to implying the basal archosauromorph Sharovipteryx to be a dinosaur, this article uses a highly fanciful reconstruction of the taxon taken from an extremely unreliable source . Several paleontologists have satirized the sensationalist nature of typical dinosaur documentaries on their blogs as well. This April Fools' joke on Tetrapod Zoology sets out to "prove" that old-school dinosaurs are correct after all, and contains a number of jabs at some infamous fringe groups. Lampshaded during the loading screen of an older LEGO game, Dino Quest, based on the Dinosaurs toy-line, which has Dr. Kilroy commenting on the inaccuracies of the game and spouting well-researched paleontology trivia. But even he gets one thing wrong: flowering plants were around in the Cretaceous. Lampshaded in Welcome to Night Vale. Cecil initially refers to Pteranodon as dinosaurs. Later (after being re-identified as pterodactyls) Cecil is informed that Pteranodon and pterodactyls are not in fact dinosaurs. Doubly subverted in a much later episode. Lauren, like Cecil, refers to Pteranodon as dinosaurs. Kevin immediately informs her that Pteranodon are not dinosaurs. They're arachnids. The BrainPOP minigame "Life Preservers" explicitly states that birds are dinosaurs but are dinosaurs themselves. This makes absolutely no sense ; even though birds can fly and are the only dinosaurs alive today, there's no objective reason to consider birds special compared to other dinosaurs in this regard. You'd think an educational website would know better. "Meet the Pseudosaurs" parodies this trope all over. A God-Mode Sue T. rex, bendy-necked sea serpent-like Plesiosaurus, deadly featherless Raptor, vicious bird-footed "Pterodactyl", Killer Rabbit Compsognathus and "spitting" Dilophosaurus are all included. Parodied in asdfmovie, where a sauropod keeps calling itself a Stegosaurus. Palaeo Fail was made in order to mock occurrences of these all over the internet.